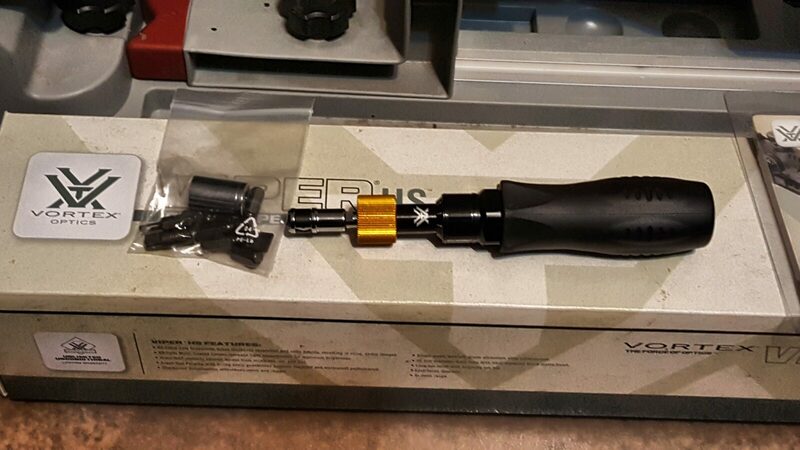 The Vortex Torque Wrench Optics Mounting Kit is Wicked!! I’m to the point with rifles that when I want to maintain accuracy, I know I need an accurate torquing driver. 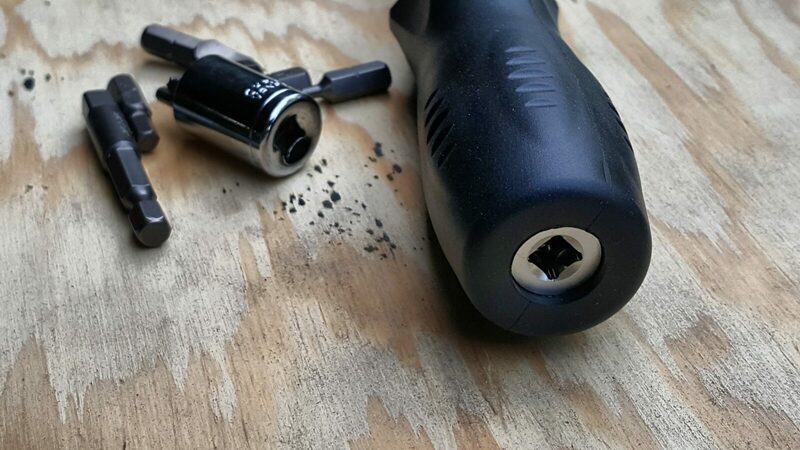 For years I have used the Wheeler Firearms Accurizing Torque (FAT) Wrench and it was good enough. For about $40 I got the base unit that included a few bits and a case. The FAT wrench had a range from 10-65 in/lbs and good enough accuracy (+/- 2 in/lbs up to 40 pounds and +/- 5% over 40 in/lbs). My only beef with it was that the mechanical scale that shows you the torque settings was in 5 pound increments. To get close to 18 in/lbs, for example, required going close to the middle between 15 and 20 in/lbs and calling it even. I used the FAT wrench pretty much exclusively from October 2014 to May 2018. It was good enough at the time – way better than going for ballpark feel “farmer tight” settings but in the back of my head though, I wanted better. 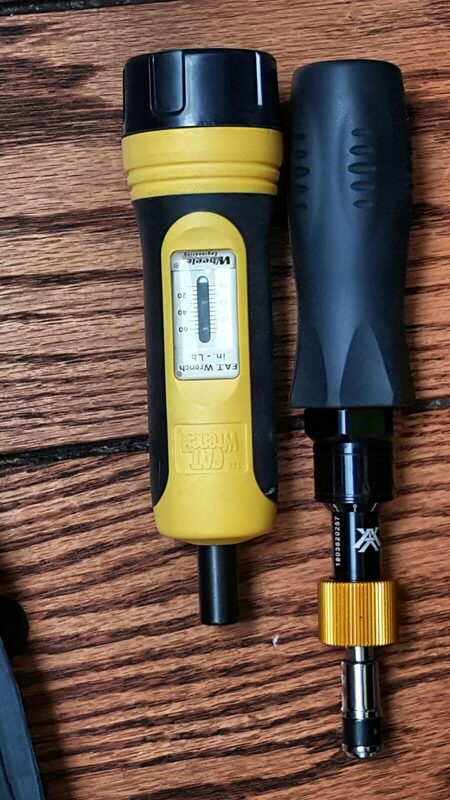 By the way, in case you are wondering why a person would get one of these torque wrenches or drivers, it’s because many torque wrenches aren’t calibrated in inch/pounds (they are often foot pounds in the US) and they may not go down as low as 10 inch/pounds (in/lbs). My interests span many types of firearms from AKs to precision rifles. With the latter, I own a number of sub-MOA rifles and they demand precision tools if you want repeatability and reliability. These rifles also have very good Vortex scopes and rings as well. 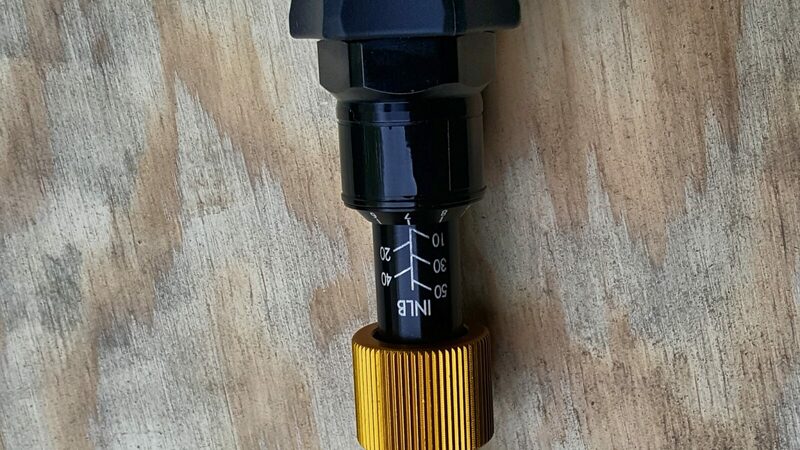 If you want consistency and the rings to not shoot loose, the value of a torque wrench becomes apparent fast. I’m a Vortex fan – there’s no two ways about. Their optics are superb and they have an absolute “we will stand behind it no matter what with no nonsense” warranty. Once in a while I will see guys troll the brand on Facebook but I honestly question whether they have ever actually even owned one. 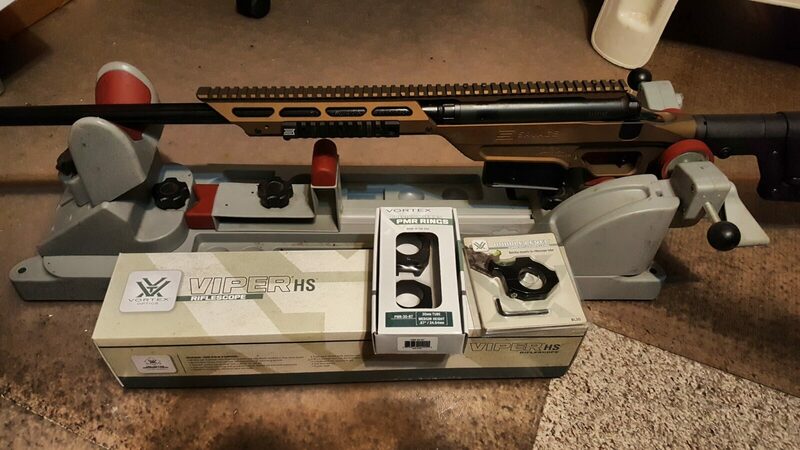 Folks, I’ve owned probably 7-8 superb Vortex scopes and a ton of red dots. I really don’t know how many red dots of various types – probably approaching a dozen. The glass is good, the scopes are durable and do you know how many times I have used the warranty? — None. In talking with guys that have, Vortex took care of them. So, let me get to the point. 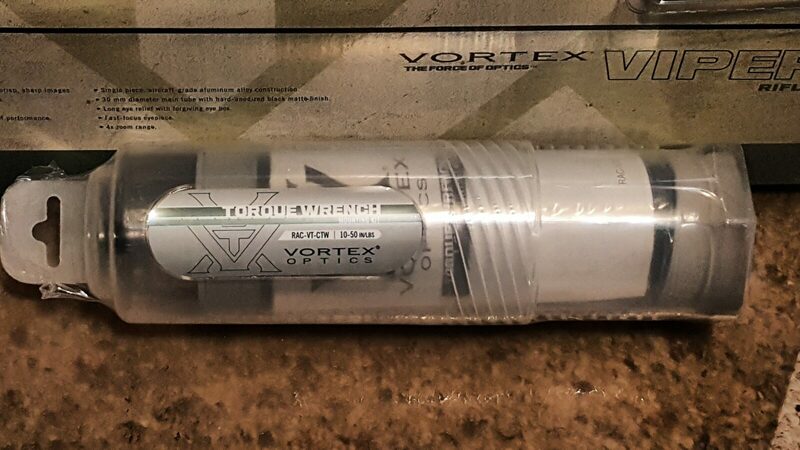 Vortex came out with a torque driver called the “Vortex Optics Torque Wrench Mounting Kit” that goes from 10-50 in pounds in calibrated 1 in/lbs increments that you set like a micrometer. When it arrived, the first thing I noticed was the heft. This is a solidly built metal tool that screams quality. It comes with a few bits. 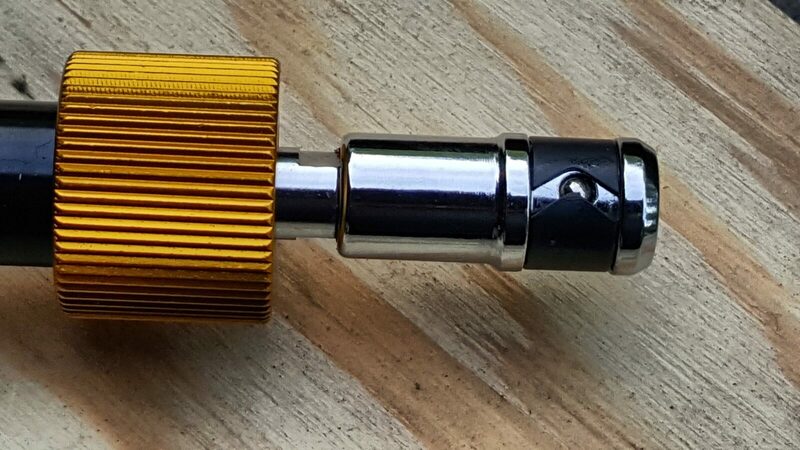 You pull the copper colored locking ring down and turn the handle to get the torque you want. I did find that you have to push the bits in very firmly. There is a detent ball that holds the driver bits in and it is surprisingly stout. A nice touch is that the end of the handle has a 1/4″ socket if you want to use a ratchet wrench for higher torque applications. For example, Vortex precision rings can go up to 50 in/lbs. I can do that by hand most of the time but a ratchet makes it much easier. On the topic of bits, it is a standard 1/4″ drive so you can get a large collection of bits and pair it up with this unit. For example, I had a Home Depot Husky brand driver with a ton of bits that I picked up on sale at some point and just had sitting on the shelf. I put it with the Vortex and its few included driver bits. Additionally, when I am working on a firearm, I typically have my Weaver deluxe toolkit open as well. It contains a great selection of bits that you tend to find on firearms. There is one thing I changed though – the Vortex unit comes in a round plastic case that is nice and strong but I don’t have the patience to try and put it all back together for storage. 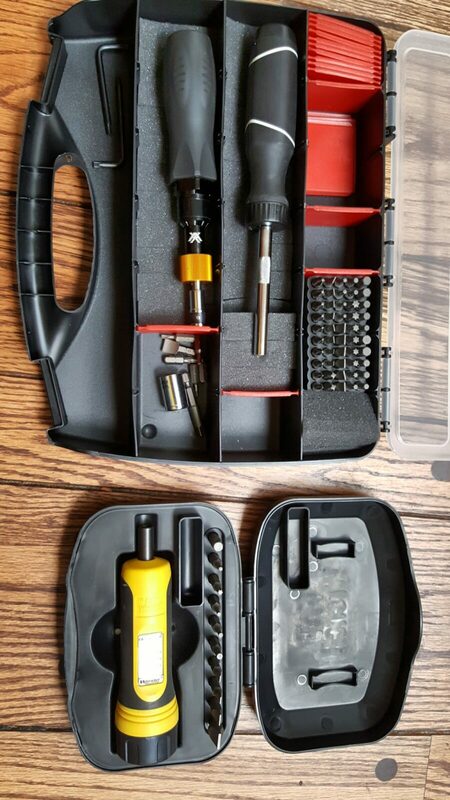 So, I hopped down to Ace hardware and bought a case to hold the Vortex torque driver, the Husky driver and all the bits plus I have room for more storage. I also used some of my spare pluckable foam left over from cases to pad the bottom of the case. In this next photo, you can see what I mean about precisely setting the torque on the wrenches. My Vortex Precision Scope Rings specify a torque of 18 in/lbs. 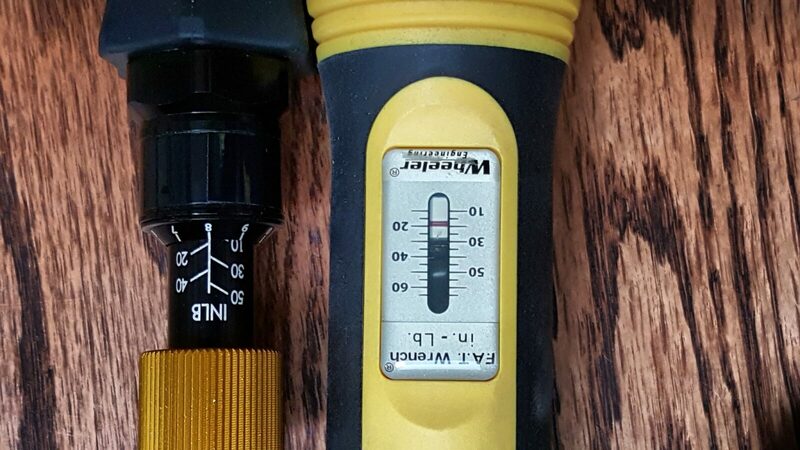 With the Vortex wrench, you can precisely set it for 18 pounds. 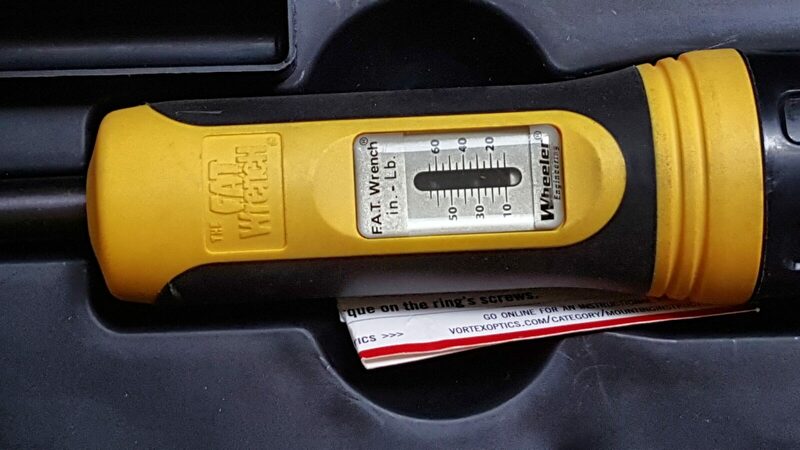 With the FAT, it’s somewhere around 17-19 pounds plus we already know the wrench’s accuracy is limited to +/- 2 in/lbs as well. 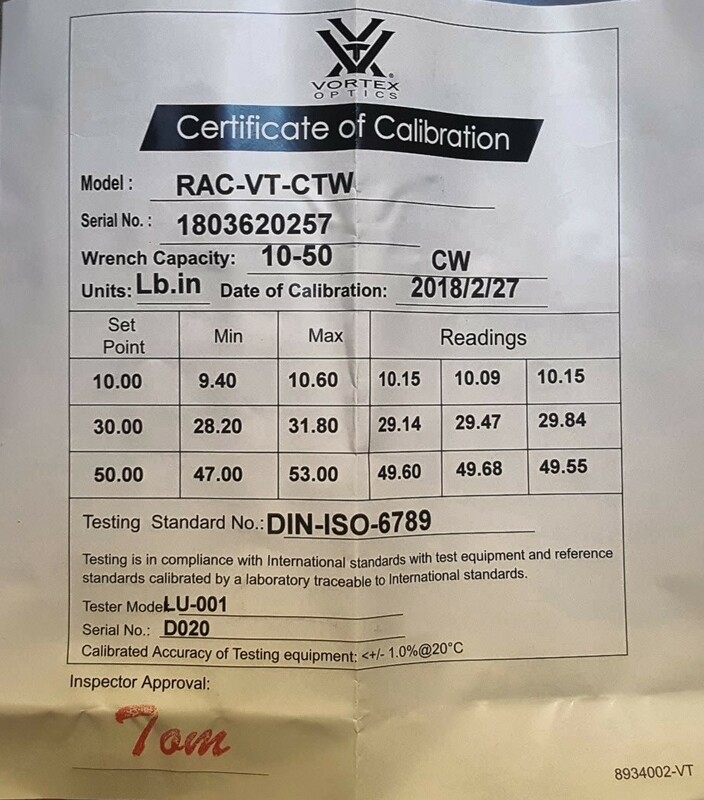 On the topic of accuracy, the Vortex driver comes with a certificate of calibration to testing standard DIN-ISO-6789 by a gentleman named Tom on Feb 27, 2018. 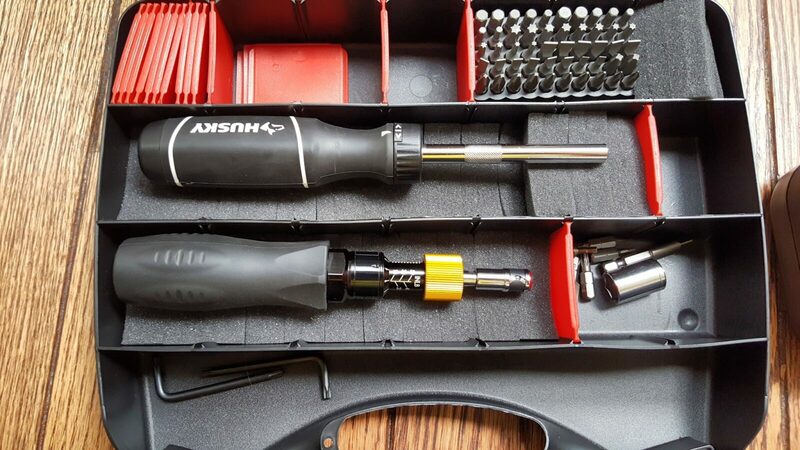 You can see my specific wrench nails the accuracy – no more guesswork and no more ballpark torque setting. 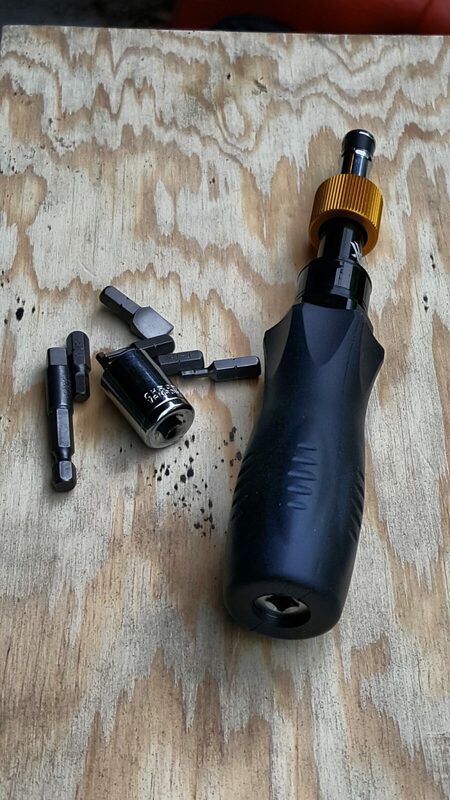 In summary, I am very happy with my Vortex wrench and would recommend it to anyone doing precision firearms work, notably optics. You can pick one up at a very reasonable price from Amazon and you ought to do it. Amazon products are listed below.